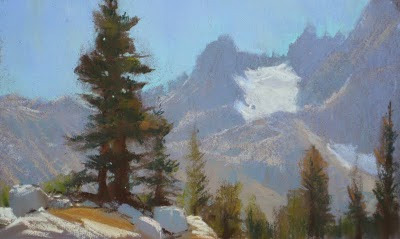 I'm going to be giving a 4 day pastel workshop at the Sierra Nevada Field Campus mid-summer, from July 26-30. Class size is limited to 12. The field campus is run by San Francisco State, and is located in the Sierra Buttes, along the north fork of the Yuba River. I took an astronomy class up there about 4 years ago, and have wanted to teach a workshop there ever since. There are numerous small lakes in glacially carved granite basins that are very accessible by car, or an easy hike. The region is like a mini-Sierra buffet of beautiful scenery. Accommodations are available at the campus. The campus itself is composed of large tents on platforms spread along a sloping river drainage, with a large dining hall/classroom building. Hot showers and bathrooms are provided. It is rustic but quite comfortable. The cost of the workshop itself is $400, the accommodations are extra, and vary according to the options you can choose, involving a meal plan, as well as whether you bring your own tent, or decide to stay elsewhere, but dine on campus, etc. 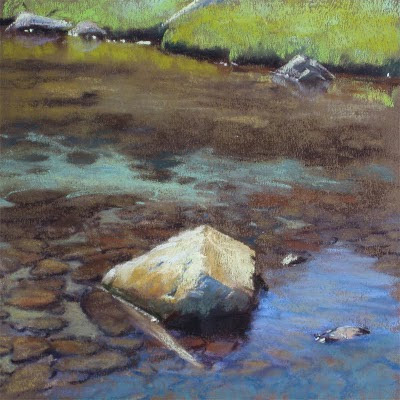 There will be some lectures, daily plein air work and demos, as well as one-on-one time. This is an opportunity for some immersion in the challenges and rewards of painting on site, capturing light at different times of the day. 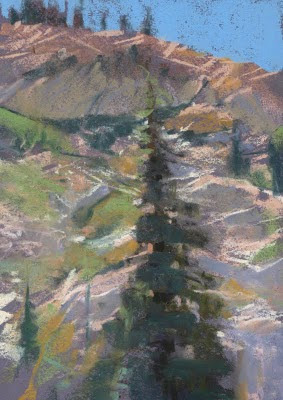 Painting in the Sierra is a wonderful sensory experience... the character of light at higher altitudes , the glacial basins of granite, the range of color of in the creeks and lakes. I am always inspired by working in the mountains and I hope you'll come away with impressions of your own that will endure. Here's the link to the website for the classes offered this summer. Just click on the courses link to find a class description. All signups have to be done through the website, so they can keep track of the number, but I'll be happy to answer any questions you have. I work as a designer at a computer animation studio. I've been painting outdoors for 20 years. My work can be found in several galleries listed in the links section.